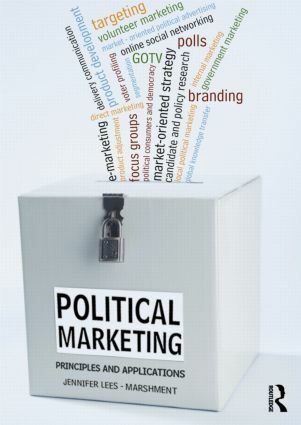 Political Marketing is the first comprehensive textbook to focus on political marketing, and introduces students to how candidates, parties, elected officials and governments around the world utilise marketing concepts and tools win elections and remain in office. analyses the implications of political marketing for democracy - are we happy to be 'citizen-consumers'? illustrates theories with clear examples integrated with topical discussion points, and provides essay and applied assessment suggestions in each chapter. Presented in clear and engaging style, this textbook offers sophisticated understanding of this exciting new area. Written by a leading expert in the field, it is essential reading for all students of political marketing, parties and elections and comparative politics.